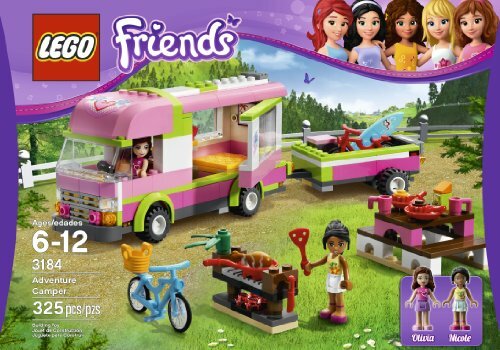 With the LEGO Friends Adventure Camper, kids can build a camper, trailer, picnic table, and campfire and make up stories with the two included LEGO Friends mini-dolls. Olivia and Nicole can ride the two included bikes or surf on the surfboard before coming back to the camper to make dinner next to the campfire with the frying pan, spatula, plates, and other kitchen accessories. The camper's roof and side door open for easy access to cooking and sleeping areas. Explore the outdoors with Olivia and Nicole on their camper. Includes a picnic table and grill for cookouts. 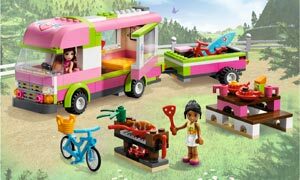 The LEGO Friends Adventure Camper is packed with different inspirations for creative play. Your child can place the Olivia and Nicole mini-dolls into the front seat for driving adventures, or they can open the side door for access to the camper's beds and kitchen when they stop for the night. The camper's trailer also has space for the dolls' bikes and surfboard. And with the picnic table and campfire with grill, the dolls can have cookouts wherever they go. With detailed instructions suitable for kids from 6 to 12 years old, the LEGO Friends Adventure Camper makes it easy and fun to build a pink and green camper with opening side door and roof that tilts up for easy access to the kitchen and beds. Fine motor skills will get a workout as children construct the trailer and picnic table. Kids can also practice role-playing as they take Olivia and Nicole from riding bikes to making dinner to driving to their next destination. The Adventure Camper comes with lots of accessories for the mini-dolls' outdoor adventures. Olivia and Nicole can ride bikes, go surfing, and hang out at the picnic table. The kitchen includes shelves of accessories, including plates and utensils, a chicken, a bowl and cups, muffins, a spatula, a frying pan, and a baking tin. 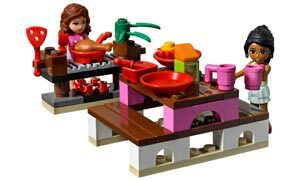 LEGO Friends mini-dolls, accessories, and bricks are compatible with other LEGO bricks and accessories. LEGO Friends Adventure Camper (325 pieces) including Olivia and Nicole mini-doll figures, two toy bicycles, surfboard, kitchen accessories, stickers, and building instructions. Pull your trailer and bikes wherever you go.